Serkis is the pulse that keeps War for the Planet of the Apes beating, infusing so much humanity into Caesar. In 2011, The Planet of the Apes saga found itself getting a reboot from the 1970's version of the story. In this reimagined world, we see how the apes became more intelligent as the movie focused on one specific ape named Caesar (Andy Serkis; The Lord of the Rings Trilogy). Caesar was born in a science lab where the animals were part of an experimental drug program that was attempting to slow or stop the progression of Alzheimer's disease. However, the drug, while killing humans, seemed to make the apes smarter. Eventually, Caesar grew up to become the leader of the apes causing the humans to fear them. The second film sees the remaining humans asking Caesar for help while the apes fracture into splinter groups who oppose Caesar's kind treatment of the humans. In this third installment, the war rages on between the humans and apes as the humans try to find and destroy the apes while the apes want nothing more than to be left alone. Leading the charge against the apes is "The Colonel" (Woody Harrelson; Now You See Me) who wants to eradicate the apes from the earth once he has used them for his own, dark purpose. Of course, Caesar, realizing the Colonel is insane, wants to stop him, especially after the man kills Caesar's wife and son. However, things are more complicated than that. It seems the Colonel is the "splinter group" in this film as he sets out to kill those infected by the simian virus, including his own son. Instead of killing humans, the virus has now mutated to make them mute and less intelligent, essentially turning them into "apes". For this reason, the Colonel wants them all killed in order to stop spreading the virus. Meanwhile, the military wants to stop the Colonel so he takes over an abandoned internment camp, captures the apes and uses them to fortify the camp. Unfortunately for him, the apes are too smart and when the military attacks, the rebels are eradicated all while the apes escape to find a new home. Serkis is the pulse that keeps this film beating, infusing so much humanity into Caesar. He is the king of motion capture acting as far as I am concerned and he makes Caesar an animal we all feel for and want to help. Harrelson is great as well, playing the Colonel who seems to be just on the edge of sanity. While heartless, you can't help but feel a small bit of sympathy for him especially when you see his fate at the end of the film. The other actors playing motion capture, such as Steve Zahn (Dallas Buyers Club) and Karin Konoval (2012), are terrific as well. Relative newcomer Amiah Miller (Lights out) hits it out of the park as the young, mute girl who is taken in by the apes. The 4K UHD Blu-ray is really something special to watch as the 2160p high definition video quality shows every detail in sharp clarity. Every hair on the apes' bodies are unique and stand out. The cinematography is also enhanced by the quality and beautiful vistas are glorious and vibrant. The Dolby Atmos audio enhances the viewer's pleasure as explosions surround you as you watch the action and helicopters flying into view spread across from one side of the room to the other utilizing all audio channels. 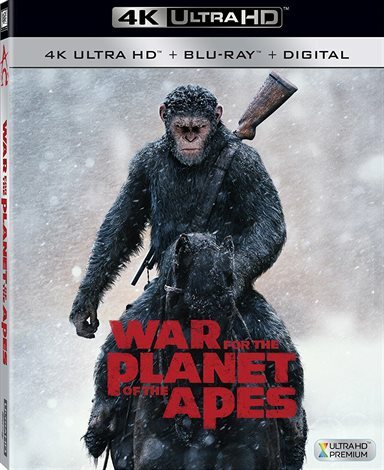 The Combo pack has a number of extras including a digital download code, Audio Commentary, Concept Art Gallery, Deleted Scenes, Waging the War for the Planet of the Apes, All About Caesar, WETA: Pushing Boundaries, Music for Apes, Apes: The Meaning of It All, The Apes Saga: An Homage, and Trailers. I enjoyed the features All about Caesar and Waging the War for the Planet of the Apes but the deleted scenes and The Apes Saga: An Homage could easily be skipped. Of the three films in the trilogy, I think I enjoyed this one the least. In the previous movies, Caesar evoked more sympathy from me than this time around and the pacing of this film I felt was slower, especially in the beginning. However, having said that, I still feel it is a strong film with a lot of terrific elements. I do think this version should end with this last film putting Caesar to rest finally. If you are a fan and you own the first two films, then you need to buy this one as it won't disappoint, especially in 4K. Download War for the Planet of the Apes from the iTunes Store in Digial HD. For more information about War for the Planet of the Apes visit the FlickDirect Movie Database.